Doing things cheaper: during the 1970s the increasing financial pressure on the national healthcare systems forced the research for reducing economic cost per case: healthcare was to be delivered in the shortest time, in the least expensive environment, by the least expensive professional, using the cheapest drugs or equipment sufficient to ensure effectiveness and safety. In one word: efficiency was the main relationship between inputs and outcomes. Economic evaluation studies and efficiency indicators begun to appear in the healthcare literature. Doing things right: during the 1980s, besides efficiency, there was a new imperative, the improvement of the healthcare delivery quality. As patients become more informed, more assertive and better organized, their expectation increased. Putting together the two paradigms, doing the things cheaper and doing the things better, fosters the new paradigm of doing things right. Doing the right things right: in the last decades the overall objective in healthcare is to do more good than harm. The key factor is the level of scientific evidence which support a medical action. This level is determined by the quality of the research on which the evidence is based. Evidence based medicine is the conscientious, explicit, and judicious use of current best evidence in making decisions about the care of individual patients . The practice of EBM means integrating individual clinical expertise with the best available external clinical evidence from systematic research. By individual clinical expertise we mean the proficiency and judgment that individual clinicians acquire through clinical experience and clinical practice. Increased expertise is reflected in many ways, but especially in more effective and efficient diagnosis and in the more thoughtful identification and compassionate use of individual patients' predicaments, rights, and preferences in making clinical decisions about their care. By best available external clinical evidence we mean clinically relevant research, often from the basic sciences of medicine, but especially from patient centered clinical research into the accuracy and precision of diagnostic tests (including the clinical examination), the power of prognostic markers, and the efficacy and safety of therapeutic, rehabilitative, and preventive regimens, as determined by clinical trials. External clinical evidence may both invalidate previously accepted diagnostic tests and treatments and replace them with new ones that are more powerful, more accurate, more efficacious, and safer. CPGs are one of the key point of the EBM  referring to the management of individual patients through individual clinical expertise integrated with the judicious use of current best evidence from clinical care research. CPGs are a good example of KM, where the process of systematic review of the scientific literature is a source of knowledge to be integrated into and complemented by local, practice-based evidence for individual and site-specific clinical decision making. There are several official organizations publishing CPGs with the aim of diffusing them within the medical community. Most of them offer CPGs on the web in textual format with some useful hyperlinks. One of the most important organization providing CPGs access online is the National Guideline Clearinghouse (NGC). Through the website it provides access to CPGs resources through a list organized by pathology or through searching criteria. The NGC mission is to provide physicians, nurses, and other health professionals, health care providers, health plans, integrated delivery systems, purchasers and others an accessible mechanism for obtaining objective, detailed information on clinical practice guidelines and to further their dissemination, implementation and use. As CPGs are evidence-based, it is fundamental to grade all the recommendations on the basis of the predictive power of the study designs from which recommendations are obtained. In other words, the grading assigned to a recommendation is related to the likelihood that, if that recommendation is implemented, the predicted outcome will be achieved. This is the reason why good CPGs provide at least the “Level of Evidence” for each provided recommendation. SIGN provides also a way to mark the “Good practice points” which are important practical points that the guideline development group wish to emphasize but for which there is not, nor is there likely to be, any research evidence. These are not an alternative to evidence-based recommendations, and should only be used where there is no other means of highlighting the issue. A similar grading system has been adopted by the National Institute for Clinical Excellence (NICE), the independent organization responsible for providing United Kingdom national guidance on the promotion of good health and the prevention and treatment of diseases. On 1st April 2005 NICE joined the Health Development Agency to become the new National Institute for Health and Clinical Excellence. The grading system adopted is still based on the grading system proposed by the US Agency for Health Care Policy and Research. Which has been adapted from the Agency for Healthcare Policy and Research (AHCPR) system US Department of Health and Human Services, Public Health Service, Agency for Health Care Policy and Research (1992). Acute pain management: operative or medical procedures and trauma. Rockville MD: Agency for Health Care Policy and Research Publications. Another interesting CPGs grading is the “strength of recommendation”. The strength (or grade) of a recommendation for clinical practice is based on a body of evidence (typically more than one study). This approach takes into account the level of evidence of individual studies; the type of outcomes measured by these studies (patient-oriented or disease-oriented); the number, consistency, and coherence of the evidence as a whole; and the relationship between benefits, harms, and costs. The link between a set of guidelines and the scientific evidence must be explicit, and scientific and clinical evidence should take precedence over expert judgment. Most of the methods for CPG development, such as the already mentioned SIGN's original Criteria for Appraisal of Clinical Guidelines for National Use , and the more recent AGREE (Appraisal of Guidelines, Research and Evaluation for Europe) guideline appraisal instrument are based on these founding principles of guideline development . Without going into the deepest details, the CPG development process or life cycle can be summarized as in figure 2.6 in which it is quite clear that the dissemination of CPGs is under textual form (books or nowadays hypertext documents). An example of a detailed CPG development process consists in the overview of the SIGN guideline development process in figure 3. The health care process must be contextualized on a specific patient. Certainly textual formats cannot change their shape in front of the patient problems and needs. For these reasons and for producing alerts and remainders or in general patient-tailored suggestions, it is necessary to computerize CPGs. In the last years, many research groups put efforts in the computerized CPGs field and developed tools for the representation and execution of CPGs [13, 14, 15, 16, 17, 18, 19, 20, 21, 22, 23, 24], and recently two comprehensive papers has been published about the comparison of the different formalisms and tools [25, 26]. The computerization of guidelines could lead to several improvements with respect to the traditional textual format: the text disambiguation, the possibility of viewing the guideline at different levels of detail without loosing the entire view, and the possibility of generating patient-tailored suggestions. This could help physicians to better comply with CPGs. However, recent literature shows that these potential benefits are hardly achieved by the CPGs everyday usage [27, 28]. In particular, it has been argued that the CPGs failure to support medical decision making could be due to the poor user's willingness to use them . In turn, poor willingness could derive from a low integration with the existing legacy systems and a low consideration of organizational and human aspects, the so called "socio-technological issues". From a KM point of view, computerized CPGs are models trying to make the knowledge embedded in textual CPGs as explicit as possible. It is in fact a codification that aims to put medical knowledge into a form that makes it accessible to those who need it. Codification literally puts knowledge into a code to make it as organized, explicit, portable and easy to understand as possible. Obviously, whichever method of codification will be used (singly or in combination) within an organization, it will lead to value and in the same time to limitations. Thus, new paradigms and technologies for supporting knowledge codification activities are necessary. The CPGs, resulting from a complex process based on scientific evidence and experts' consensus, are normally published in unstructured narrative form in textual or electronic (hypertext) documents. The first step for creating a decision support system is their representation into a computational format. Through an authoring tool, these models will be created once, disseminated and adapted locally  on the basis of the needs. The enactment systems will implement these models and help the clinicians in their activity, meanwhile keeping track, in a "logs" database, of all the tasks carried out for each individual patient. This controlled loop will help locally tuning the CPG and, at a higher level, suggest modification of the original guideline. Asbru  is being collaboratively developed at Ben Gurion University and the Vienna University of Technology. It is a time-oriented, intention-based, skeletal-plan specification language that is used to represent clinical protocols . Skeletal plans capture the essence of a procedure, but leave room for execution-time flexibility in the achievement of particular intentions. Asbru’s developers have enriched skeletal plans by (1) characterizing plan attributes such as intentions, conditions, and effects, (2) adding a rich set of ordering of plans, and (3) defining temporal dimensions of states and plans. Uncertainty in temporal scope and parameters can be expressed by bounding intervals. EON  was developed at Stanford University and provides a suite of models and software components for creating guideline-based applications. It views the guideline model as the core of an extensible set of models, such as a model for performing temporal abstractions. EON uses a task-based approach to define decision-support services that can be implemented using alternative techniques . Its guideline execution server uses formalized clinical guidelines and patient data to generate situation-specific recommendations. A temporal data mediator supports queries involving temporal abstractions and temporal relationships. A third component provides explanation services for other components . GLIF  the Guideline Interchange Format version 3, has been collaboratively developed by groups at Columbia, Stanford and Harvard Universities (the InterMed Collaboratory). GLIF stresses the importance of sharing guidelines among different institutions and software systems. GLIF tries to build on the most useful features of other guideline models, and to incorporate standards that are used inhealth care. Its expression language was originally based on the Arden Syntax  and its default medical data model is based on the HL7 Reference Information Model (RIM) . A subsequent object-oriented language, GELLO , is being refined for consideration as an HL7 standard. PRODIGY  was developed at the University of Newcastle upon Tyne. It provides support for chronic disease management in primary care. The PRODIGY project’s aim is to produce the simplest, most readily comprehensible model necessary to represent this class of guidelines. Teams of clinicians have used Protégé’s knowledge engineering environment  to encode three complex chronic –disease management guidelines. Over 150 guidelines encoded in PRODIGY’s simpler Release One model have been translated into the current model. Two vendors have integrated identical PRODIGY components into their clinical information systems for general practitioners . PROforma  was developed at the Advanced Computation Laboratory of Cancer Research, UK. It combines logic programming and object-oriented modeling and is formally grounded in the R2L Language . One aim of the PROforma project is to explore the expressiveness of a deliberately minimal set of modeling constructs. PROforma supports four task types: actions, compound plans, decisions, and enquiries. All types share attributes describing goals, control flow, preconditions, and post-conditions. The simple task ontology should make it easier to demonstrate soundness and to teach the language to encoders. GASTON [47, 48] was developed by a joint effort of the Department of medical Informatics of Maastricht University and the Signal Processing Systems group of the Eindhoven University of Technology. The guideline representation formalism uses a frame-based model as an underlying mechanism. The formalism is non-monolithic, meaning that it can be extended with additional classes to capture new guideline characteristics. Similar to the GLIF, EON and Guide approaches, the Gaston guideline authoring environment represents and visualizes guidelines by temporally sequenced graphs (flowcharts) of frame instances from the guideline model. GLARE  was developed by the Dipartimento di Informatica, Università del Piemonte Orientale "Amedeo Avogadro", Alessandria, Italy, in co-operation with the Laboratorio di Informatica Clinica, Azienda Ospedaliera S. Giovanni Battista, Torino, Italy. The formalism consists of a limited, but very focused and clearly understandable set of primitives. It is made up of different types of actions: plans (i.e. composite actions, hierarchically decomposable in their sub-actions) and atomic actions. Atomic actions can be queries, decisions, work actions and conclusions. All actions are linked by control relations (e.g. sequence, alternative, repetition), defining their order of execution. SAGE & Guide will be introduced later on as both enable the integration with the workflow of care process. Updated news about methods and tools to support the computerization of clinical practice guidelines are constantly published by OpenClinical. OpenClinical website (www.openclinical.org) provides an increasingly comprehensive set of resources on advanced knowledge management methods, technologies and applications for healthcare (methods and tools for representing computerised clinical guidelines). It is a non-profit organisation co-ordinated by an international group from leading research and teaching organisations. The goal of knowledge management is not only increasing the performance of individuals within the organization but of the organization as a 'whole'. It implies an organizational view of the problem where individuals cooperate, as much as possible carrying on evidence-based care processes, each behaving according to the role the organization assigned her/him . Thus, only cooperative care processes can attain the goals, in terms of efficiency, effectiveness and quality of care, the organization planned to achieve . A strong contribution in this direction is coming in these years from the workflow area. A Workflow Management System (WfMS) is defined by the Workflow Management Coalition , a non-profit, international organization, as "the automation of a business process, in whole or part, during which documents, information or tasks are passed from one participant to another for action, according to a set of procedural rules". 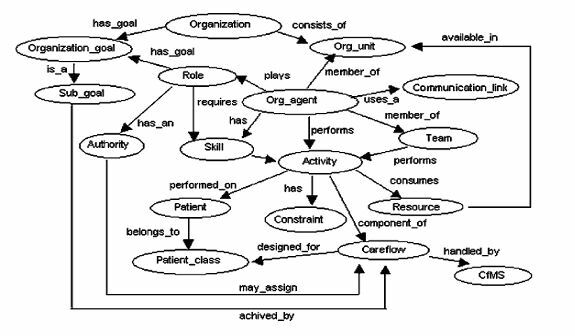 Taking an organizational view of evidence-based care processes, Stefanelli proposed the definition of "Careflow Management Systems (CfMS)" to indicate similar support systems in medical domains where guidelines have been developed and disseminated. Careflow Management Systems (CfMSs) are WfMSs supporting medical knowledge management in clinical domains. They are case-based, i.e., every piece of work is executed for a specific patient. One can think of a patient care process as a Cf instance. The goal of CfMSs is to handle patients by executing medical tasks in a specific order. A Cf process definition specifies which tasks need to be executed and in what order. A task, which needs to be executed for a specific case, is called a work item. Most items are executed by a resource, either human or technological. A work item executed by a resource is called activity. To facilitate the allocation of work items, resources can be grouped into classes. The resource class based on the capabilities (i.e., functional requirements) of the HCOs members is called organizational agent. If the classification is based on the structure of the HCO, such a resource class is called organizational unit (e.g., team, laboratory, clinic, department, etc.). A CfMS may also contribute to solve the communication problem within HCOs since it is able to manage automatically a great amount of communication acts among organizational agents involved in patient care. Such view was stimulated by the "continuum view" developed by Enrico Coiera : he pointed out that communication and computation tasks are related, but drawn from different parts of a task space. We strongly believe that knowledge management, in general, and CfMS, in particular, may provide an effective approach to overcome the false dichotomy between communication and computation tasks: careflow technology can be used to make communication more efficient by supporting organizational agents in sharing the needed medical and organizational knowledge. Figure 1 shows the basic elements of the organization ontology on which the model of an HCO can be based on. It represents an adaptation of the organization ontology developed within the TOVE project . HCO consists of a set of organizational units (e.g., wards, laboratories, clinical units, rehabilitation units, etc. ), a set of organizational agents (members of an organizational unit), a set of roles that the members play in the organization, and a set of organizational goals that they are committed to achieve. Figure 5 - Basic elements of the organization ontology adapted from the one developed within the TOVE  project. A stroke care management system must match the HCO's resources with generally agreed upon guidelines (evidence-based medicine), for each of the clinical presentations of the disease. The system should also show that its patterns of care are effective and efficient. As an example of organisational knowledge representation, figure 6 depicts the taxonomy of roles played by organizational agents involved into the post-stroke rehabilitation process within a rehabilitation hospital . Stroke rehabilitation frequently involves the services of several rehabilitation disciplines. The skills required depend on the nature of the patient’s deficits. Medical specialties that are commonly involved include physical medicine and rehabilitation, speech therapy, neurology, geriatrics, internal medicine, psychiatry, and family practice. Consulting physicians from other specialties (for example, cardiology, haematology, etc. ), are called on as needed. Figure 6 shows the hierarchy of roles played by the organizational agents directly involved in the rehabilitation process. They operate within either clinical wards or rehabilitation units, but they may also be involved in several multidisciplinary activities, mainly whenever some collective decisions have to be made (e.g., identification of rehabilitation needs, assessment of deficits’ recovery). 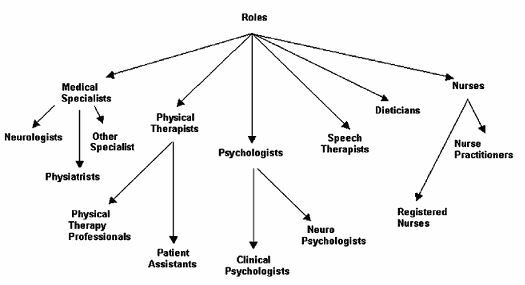 Figure 6 - Taxonomy of roles played by organizational agents involved into the post-stroke rehabilitation process within a rehabilitation hospital in the Careflow project . CPGs management systems and Workflow management systems are complex themselves and putting them together leads to an incredibly high complexity. SAGE and Guide implemented a different approach that can be characterized as “workflow aware”. They both have defined models for integration of guideline-based decision support with the workflow of care process. In both cases medical and organizational issues are separated and interaction is carried out by communication contracts and the connection with the EPR is performed through a Virtual Medical Record . In the SAGE project the guideline decision support system will not be in control of host systems’ workflow management but it will respond to opportunities for decision support in the care process. SAGE needs to model enough of the workflow contexts to recognize appropriate events that should trigger decision support services. Thus, guideline knowledge must support operations in an eventdriven reactive system (unidirectional communication) and it must take into account clinical and organization contexts such as care setting and provider roles. Instead of just creating an electronic version of a clinical practice guideline, SAGE formalizes guideline knowledge to be used in specific scenarios and settings. Therefore, in the SAGE modelling approach, it is not required to model detailed workflow. In the Guide approach, a Guideline Management System (GLMS) interacts with a given WfMS8 through messages according to specific contracts. Communication is bidirectional, it is possible that the GLMS asks to the WfMS for performing some tasks and vice versa it is possible for the WfMS to ask for medical decision support. WfMS has to be developed by third parties with the desired level of detail and it is also possible to run the GLMS without a WfMS. Ontologies and terminologies together with a set of data-types are wrapped by contracts and represent the common ground, fundamental for communication between the different areas. The strong separation between medical and organizational issues allows improving not only the software product (reducing crosstalk, powering parallelization and promoting integration with legacy systems provided by different suppliers) but also the quality of interaction between the system and the domain experts, who usually have different skills and background (improvement of socio technological issues). Formalization knowledge: it manages knowledge representation formalisms, among which computer-based tools (it can be considered a part of the technical domain above defined). Common, based on common knowledge, e.g. organizational charts (charts defining roles and hierarchies within hospital personnel). Putting together knowledge areas and formal models, it is possible to describe a contextualized knowledge conversion process, as in Figure 4.1. Related to the left part of the figure (medical area), we can imagine that specific CPGs (medical models) have been implemented in a hospital ward. Of course, physicians will act by mixing the knowledge contained in the models (explicit medical knowledge) with their skills and experience (tacit medical knowledge) and, in special cases, they will not comply with CPGs. Such process (internalization) will lead each expert to be more and more efficient in evaluating the formal models and possibly criticizing them. Therefore, opinions about CPGs will be informally shared among colleagues (socialization). Once an agreement is found, with the help of the knowledge engineer it will be formalized, so updating the initial model (externalization). Combining models and other explicit knowledge, models can be reformulated and new explicit knowledge may be created (combination). If instead of medical CPGs we consider hospital reimbursement rules (organizational models) a similar knowledge transformation process could be individuated for the right part of Figure 7. Figure 7 - The knowledge conversion process in a knowledge creating organization adapted to an health care environment. It puts together the knowledge conversion process defined by Nonaka and Takeuchi  with the knowledge and models related to health care. The externalization of common models requires the socialization between different experts. Specific skill of the knowledge engineer is to elicit the expert knowledge in order to assure quality, consistency and usability of the model. During this process, the expert (physician or administrator) learns how to organize his knowledge according to the representation power of the available computational tools (socialization between expert and the knowledge engineer). It is clear that domain experts and engineers must have a sufficient common ground to be able to communicate (e.g. about terminology, basic computational tool features etc.). A. A. Boxwala, M. Peleg, S. W. Tu, O. Ogunyemi, Q. Zeng, D. Wang, V. L. Patel, R. A. Greenes, E. H. Shortliffe. GLIF3: A Representation Format for Sharable Computer-Interpretable Clinical Practice Guidelines. Journal of Biomedical Informatics (JBI), 37 (3): 147-161 2004. S. W. Tu, M. A. Musen. The EON Model of Intervention Protocols and Guidelines. 1996 AMIA Annual Fall Symposium, Washington, D.C., 587-591. Hanley & Belfus, 1996. Bury J., Fox J., Sutton D. The PROforma guideline specification language: progress and prospects. Proceedings of the First European Workshop, Computer-based Support for Clinical Guidelines and Protocols (EWGLP 2000), Leipzig 13-14 Nov. 2000. Purves IN, Sugden B, Booth N, Sowerby M. The PRODIGY project - the iterative development of the release one model. Proc AMIA Symp. 1999;:359-63. Johnson P, Tu S, Jones N. Achieving reuse of computable guideline systems. Medinfo. 2001;10(Pt 1):99-103. Shahar, Y., Miksch, S., and Johnson, P. The Asgaard project: A task-specific framework for the application and critiquing of time-oriented clinical guidelines. Artificial Intelligence in Medicine (14): 29-51, 1998. J. R. Campbell, S. W. Tu, J. G. Mansfield, J. I. Boyer, J. McClay, C. Parker, P. Ram, S. M. Scheitel, K. McDonald. 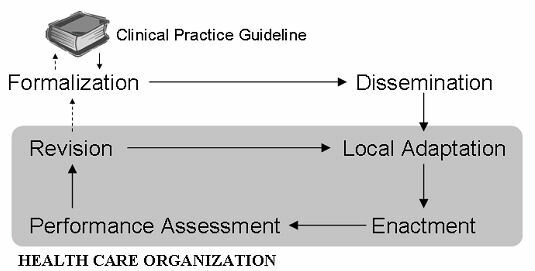 The SAGE Guideline Model: A Knowledge Representation Framework for Encoding Interoperable Clinical Practice Guidelines. 2003. P. Ram, D. Berg, S. W. Tu, J. G. Mansfield, Q. Ye, R. Abarbanel. Executing Clinical Practice Guidelines using the SAGE Execution Engine. 2003. Barner E. S., Baker S, Funkhouser E. et al. Do local opinion leaders augment hospital quality improvement efforts? A randomized trial to promote adherence to unstable angina guidelines. Med Care 2003; 41; 420-431. Eccles M., McColl E. et al. Effect of computerized evidence based guidelines on management of asthma and angina in adults in primary care: cluster randomised controlled trial. BMJ 2002 vol. 325. Lazarsfeld PF, Merton RK. Friendship as social process: a substantive and methodological analysis. In Berger M, et al. (eds.). Freedom and Control in Modern Society. New York: Octagon, 1964. D.B. Fridsma ,J.H. Gennari, M.A. Musen. Making generic guidelines site-specific. Proc. AMIA 1996, 597-601. Seyfang A, Kosara R, Miksch S. Asbru's Reference Manual, Version 7.3. Vienna University of Technology, Institute of SoftwareTechnology, Vienna; 2002. Report No. : Asgaard-TR-2002-1. Tu SW, Musen MA. A Flexible Approach to Guideline Modeling. Proc AMIA Symp. 1999:420-424. Tu SW, Musen MA. From Guideline Modeling to Guideline Execution: Defining Guideline-Based Decision-Support Services. Proc AMIA Annu Symp. 2000:863-867. Tu SW, Musen MA. Modeling Data and Knowledge in the EON Guideline Architecture. Proc Medinfo: 280-284. Peleg M, Boxwala A, Ogunyemi O, et al. GLIF3: The Evolution of a Guideline Representation Format. Proc AMIA Annu Fall Symp. 2000:645-649. Hripcsak G, Ludemann P, Pryor TA, Wigertz OB, Clayton PD. Rationale for the Arden Syntax. Comput Biomed Res. 1994;27(4):291-324. Schadow G, Russler DC, Mead CN, McDonald CJ. Integrating Medical Information and Knowledge in the HL7 RIM. Proc AMIA Annu Fall Symp. 2000:764-768. Ogunyemi O, Zeng Q, Boxwala A. Object-oriented guideline expression language (GELLO) specification. Brigham and Women's Hospital, Harvard Medical School, 2002. Decision Systems Group Technical Report DSG-TR-2002-001. Johnson PD, Tu SW, Booth N, Sugden B, Purves IN. Using Scenarios in Chronic Disease Management Guidelines for Primary Care. Proc AMIA Annu Fall Symp. 2000:389-393. Grosso WE, Eriksson H, Fergerson R, Gennari JH, Tu SW, Musen MA. Knowledge Modeling at the Millennium (The Design and Evolution of Protege-2000). Proc 12th Banff Knowledge Acquisition for Knowledge-Based Systems Workshop. Canada; 1999:7-4-1 to 7-4-36. Fox J, Johns N, Rahmanzadeh A, Thomson R. PROforma: A method and language for specifying clinical guidelines and protocols. Proc Medical Informatics Europe; Amsterdam; 1996. De Clercq PA, Blom JA, Hasman A, Korsten HHM. Design and implementation of a framework to support the development of clinical guidelines. Int J Med Inf 2001;64(2- 3):285-318. Terenziani P, Mastromonaco F, Molino G, Torchio M. Executing clinical guidelines: temporal issues. Proc AMIA Symp. 2000;:848-52. Stefanelli M. The socio-organizational age of artificial intelligence in medicine. Artificial Intelligence in Medicine 2001;23:25–47. Stefanelli M. Knowledge management to support performance based medicine. Methods of Information in Medicine 2002;41:36–43. Coiera E. When communication is better than computation. Journal of American Medical Informatics Association 2000;7:277–86. Fox MS, Gruninger M. Enterprise modeling. AI Magazine 1998;(Fall):109–21. S. Panzarasa, R. Bellazzi, C.Larizza, M. Stefanelli. A careflow management system for chronic patients. MedInfo 2004 ,ed Fieschi/Coiera e Yu-Chan Jack Li, pag. 773 - 777, (2004). Johnson PD, Tu SW, et al. A virtual medical record for guideline-based decision support. Proc AMIA Symp. 2001; pp. 294-298. Nonaka I, Takeuchi H. The knowledge-creating company. Oxford, UK: University Press; 1995.